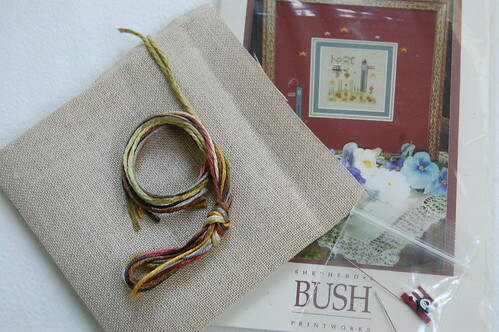 I'm stitching it on 32 ct. Natural linen using NPI and Gloriana silks. I'm not thrilled with the linen, but there is no way I would start over because of all the work I've already done. 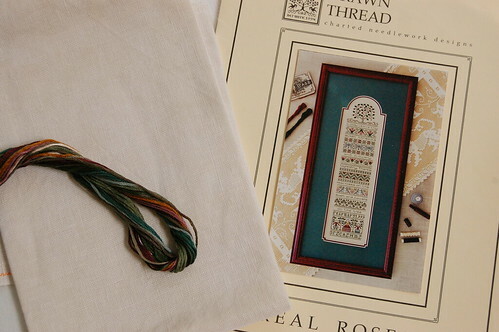 Another Drawn Thread that I've had for a long time that I'm thinking of stitching in the future is "Real Roses." I have always loved this one. I went through my fabric and found a pretty piece of 32 ct. Vintage Bisque by Lakeside Linens that I think will work for it. 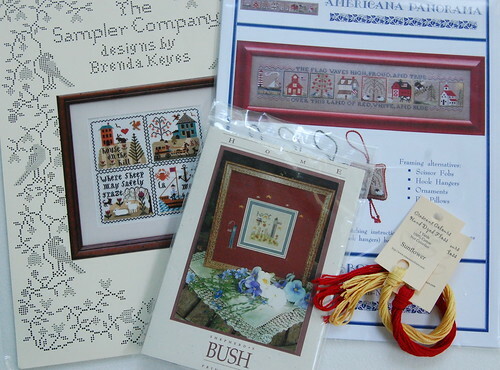 I really can't wait to start the Shepherd's Bush kit "Home." It's so sweet! "Real Roses" is one of my favorite Drawn Thread pieces. I stitched it a number of years ago, and I love it. I have "Marriage of Minds" in my stash, but haven't started. Seeing your start has got me itching to get mine out and start it, too! I can't wait to see your progress on this one. Love the 'Marriage of Minds' Nicole - it's beautiful. Marriage of Minds is beautiful. Oh I love Marriage of Minds! I need to stitch that! I love your stash! You're so lucky to have DSL right there. Have a safe trip! have a safe trip to FLorida! Marriage of the Minds is wonderful! I love the new stash too! Beautiful, Nicole! 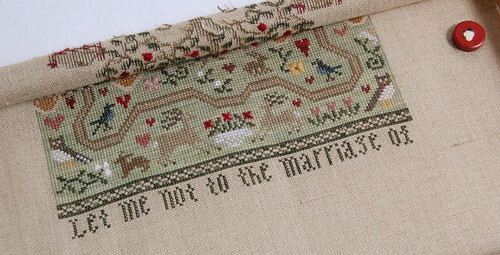 I stitched TMoM a few years ago and it's one of my favorite stitches--now that it's done. I hate all that green but Cynthia ties it up so nicely with other colors thrown in that all her samplers are so wonderful. Have a safe trip down to get the boys, and back! We'll miss you! Love the WIP and the new stash! I adore that patriotic scenes one--and the new SB too. Glad to see you are finishing Marriage of the Minds. I have never seen that one before! Marriage of the Minds is beautiful! I bet we will see a finish in no time with your smoking needles. :) I love all the stash. I have a couple of those on my "soon to buy" list as well. We seem to have very similar tastes. :) Have a safe fun trip to Florida. Have a safe trip Nicole...we'll miss your updates! Ooh....I love your new stuff! I have the Real Roses in my to do pile so can't wait to see yours if you start it. Good luck on your UFO. I read your blog regularly but haven't commented before. I just wanted to tell you how much I enjoy your blog and that after a long day at the office, this virtual visit with you is a bright spot in my day. Marriage of Minds is so pretty. 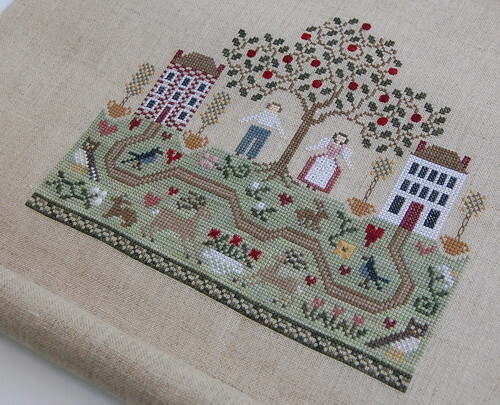 I tend to love everything you stitch. I love both of those Drawn Thread pieces. Nice to try to finish off an old UFO. That SB sheepie is cute too! I also have Real Roses by DT. Fancy a SAL? Oh what a gorgeous design you are working on. That is gorgeous! Can not wait to see more! Great new stash!